Today, I made my first baked potato in the microwave. I know. It’s kind of… no, it’s completely monumental. Normally when I’m craving potatoes I chop, season and bake for eons – flat out torturing myself – then either cover with cheese and bacon or give up and dip the crispy potatoes in ketchup. Today I was not about to do that, even as much as I want potatoes with ketchup right now. It all started when I was too lazy to make a real lunch. I thought there was tuna already made in the fridge, nope. So, yeah… potatoes. Always potatoes. They’re the best first and second place option. Unless we’re talking about pizza or apple pie or a margarita. Then potatoes can and often will take a back seat. It was one of those days, a single banana was nearing it’s end. It didn’t have days, it probably had but mere hours left of it’s short life. I had big plans for that banana and everyone was on board, especially the Mr. Actually, I had slightly different plans for this initially and then started wavering. I sometimes do that. I don’t think these would have been nearly as pretty or perfect with my first plan, so it was totally for the best that I’m completely indecisive and forever changing my mind on things. Have you ever had a bite sized cheesecake? If not, well… you’re missing out. These should be in your life, especially if you’re a banana lover. Of course if you aren’t a fan, fear not… I have lots of other cheesecake varieties to choose from. Pick one and go with it. 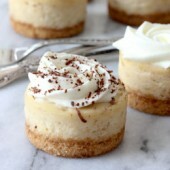 But I promise 110% that if you love bananas and of course cheesecake that you will love these mini banana cheesecakes. They’re not screaming banana at you, it’s subtle and just perfect. The Nilla Wafer crust, fresh whipped cream and dusting of shaved dark chocolate complete these. Yes, say it like Jerry Maguire. You complete me, said Jerry and the banana cheesecake. Please note that I didn’t say Jerry the banana cheesecake because I don’t tend to name my cheesecakes, just the ladybugs in the house and some random and very essential kitchen appliances…. and of course my kids and the felines creatures roaming about. Preheat oven to 350 degrees. Lightly grease a 12 cup mini cheesecake pan. 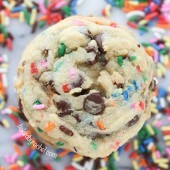 In a food processor, blend cookies until only fine crumbs remain. Mix in sugar and melted butter. Add 1 small cookie scoop of crust mixture to each cavity. Press firmly to create a flat crust. Bake for 5 minutes. In a large bowl or stand mixer, mix together softened cream cheese and sugar until smooth and fluffy. Add banana, vanilla and salt, mixing until smooth. Finally add 1 egg, mixing only until just combined. Divide mixture between cavities, roughly 1 heaping medium cookie scoops worth of filling. Cavities should be only be filled 2/3 full. Bake for 15-18 minutes. Cool to room temperature prior to chilling overnight. Prepare whipped cream by beating together heavy cream, sugar and vanilla until soft peaks form. Carefully remove cheesecakes from pan, removing disc from the crust bottom. Top off with fresh whipped cream and optional chocolate shavings. 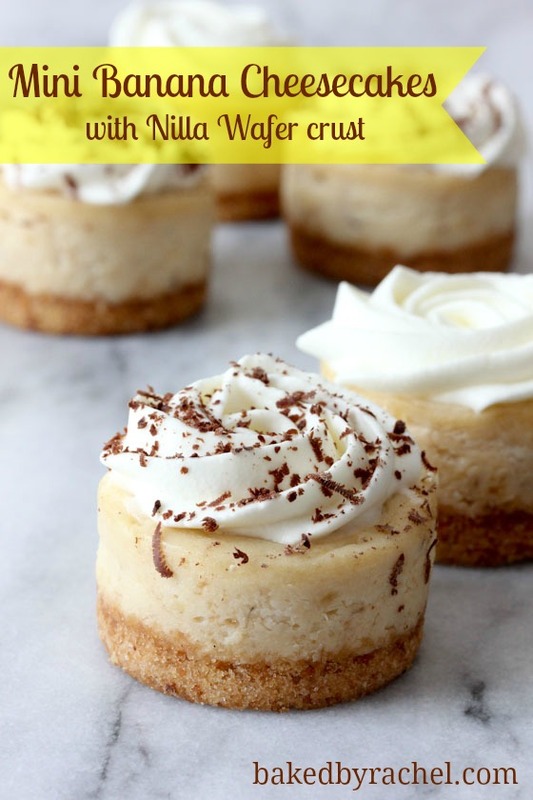 These are SO cute and I love that you used a Nilla wafer crust – such a great classic combo!! These sound so good! I love mini cheesecakes! 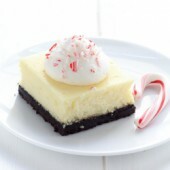 These are always so cute :) I have a mini cheesecake pan that I haven’t actually used – lol! 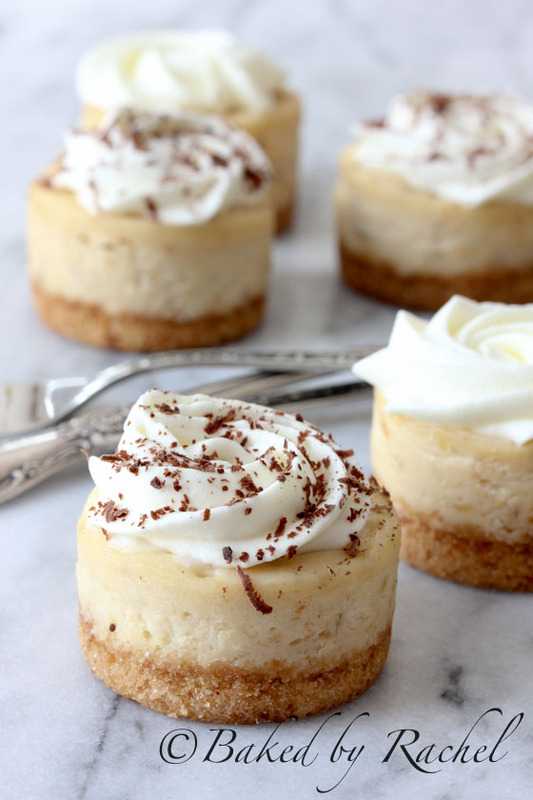 These mini cheesecakes sound amazing and look adorable.. Love the banana! These cheesecakes look delicious, and I love that they’re mini! Mini makes everything cuter :) Pinned! These are so perfect. Just love them. I have to admit that I had not heard of a mini cheesecake pan but now I must have one! Thank you for adding to my already bulging kitchen cabinets. Mini means I can pop five into my mouth real quick without anybody looking. I like this idea. I really need to get in on this baked potato situation. How have I never used the microwave for it? 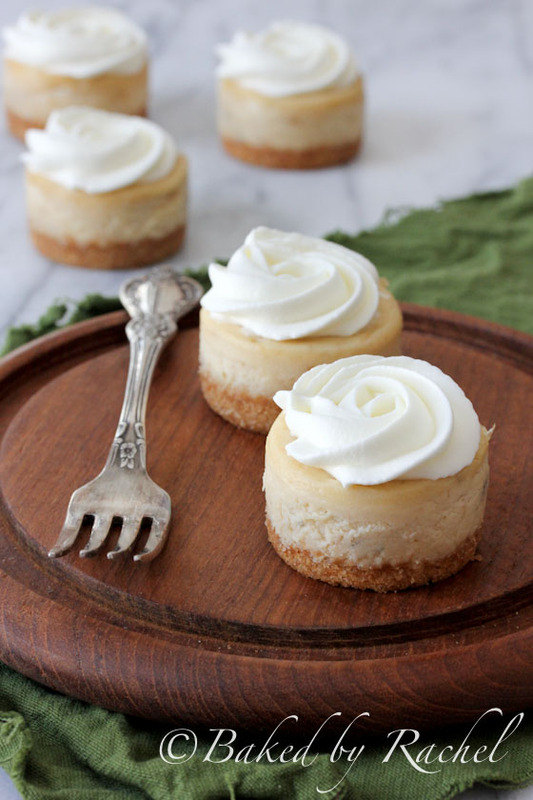 Oh and these mini cheesecakes – YES PLEASE! I just got a mini cheesecake pan too! Mini cheesecakes are my fave! Love the banana flavor that you included in these little cuties… they look so delicious and delicate! I’ve got some bananas just waiting for these cheesecakes! Yum! I need to get myself a mini cheesecake pan! I have a few bananas in my fruit bowl that I hope make it until the morning. I was going to use them in my kids waffles but I just might need to make these yummy cheesecakes instead! Wow! I can’t wait to try these:) Looks like these would be the hit of any dinner party. Pinning! New follower here! I stand by my Twitter comment – you are the mini cheesecake queen my friend! I actually have a mini cheesecake pan, but I think I’ve used it maybe once or twice at most. I need to remedy that soon, this banana version sounds awesome! That’s so sweet. And you should totally pull that pan out! Oh, such a darling looking dessert! Banana cheesecake sounds amazing, and on top of nilla wafer crust, perfect! I have a box of Nilla wafers in the kitchen right now!! Oh baby, oh baby! Banana AND cheesecake!!? Are you serious? Amazing. I need to try these! Awesome post and beautiful pics! These are so cute & I love the banana with the nilla wafer crust! Do I need to make any adjustments to the recipe to make a full size version? Please be aware that if you double this, it is at your own risk as this recipe is specifically written for 12 mini cheesecakes. That being said, if you were to adapt this to a larger version I do not have baking times for you. However, you could start by doubling the ingredients listed to be used in a 9″ springform pan. Great news – I successfully made these delicious bites over the weekend just using a cupcake pan! No adjustments needed. At the time, I didn’t think about the fact that I was using the aluminum foil lined cupcake wrappers, but I think that was key to a perfect cheesecake removal in the end. They were beutiful and delicious! Thanks for a great recipe – will be checking out your other ones for sure. The pan used for this recipe is a mini cheesecake pan, not a cupcake pan. It’s specifically designed to make the removal of the cheesecakes easier. If you do not use that, I would only recommend a cupcake pan with liners in it’s place – not a cake pan, as this recipe is specifically written for mini cheesecakes. I am making these right now for about the fifth time. I also used a regular muffin pan. I didn’t even use liners. They turned out beautifully. They are so good. I’ve got everyone wanting them. My dad lovrs bananas and cheesecake. So this is perfect. I slice a piece of banana. And put it on top. Drizzle some caramel sauce on it. Delicious. So glad to hear you and your family enjoy them so much! :) Thanks for sharing. Can you substitute the banana for pumpkin? And how much do you add? Thanks for posting this mini cheesecake recipe. I had a bunch of nilla wafers that I wanted to use up and came across this. I used 2 bananas since I had 2 ripe ones that needed to be used up as well. I added a touch of flour to stiffen the batter a bit more. I accidentally overbaked them just a touch and they turned into a creamy cake like texture which I actually really liked and it worked good for packing to work. Tasted like a creamy banana bread. Very delicious and the small size looks very cute. I would definitely make this again whenever I have ripe bananas that need to be used up. these were simply fan-tas-tic!!! I used canned whipped cream a d dusted it with cocoa chili powder. The best! These are perfect and bite size. Of course that means more to eat. How do you get the cakes out such that they all come out in their perfect shapes and the crust doesn’t stick to the pan? I used a special pan, which is linked to at the bottom of the post. It’s greased with baking spray for easy release. these are adorable! Thank you for sharing. I am definitely making these yummy lite bananas for my next party! your recipe for mini banana cheese cakes calls for “carefully removing the disc at the bottom of the pan but never mentions inserting one to begin with. Thank you for clarifying this. The recipe links to a very specific pan to use. If you’re not using that, then there isn’t a disc to insert or remove. 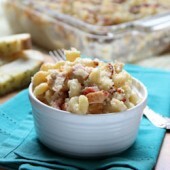 Can you make it in a pan instead of cupcakes pan I wanna make this for Christmas I hope they turn out good I am trying to find a easy recipe for Christmas I got to make macaroni and cheesee but I want to make something else to cause I always make macaroni and cheese please help. This recipe is specifically written as minis, for a mini cheesecake pan. However, if you choose that method, I’d recommend using liners. This cannot easily be converted into a full size cheesecake. Just made these, but for some reason they did not set up when baking at 325 for the indicated time. I ended up baking them for 25 mins and now after cooling down, they have completely sunken in. :( Any suggestions for next time? Cheesecakes can be finicky. There are so many possible reasons for them to fall, here are just a few possibilities. The batter was over beaten, adding too much air into it. The pan wasn’t greased properly, especially an issue with cheesecakes that don’t have a crust up the side. If the oven door was opened during baking at all, it introduced cooler air, which can cause the same problem. Oven temperature is also important, not all ovens cook the same and if your temperature is off, that could certainly be an issue. So sorry you had trouble with this, but I do hope you have better luck in the future! What if I don’t have a mini cheesecake pan? Can I use a standard cupcake pan? They’ll be wider and shorter but it will still work. I’d recommend using a liner if using a cupcake pan. Enjoy!